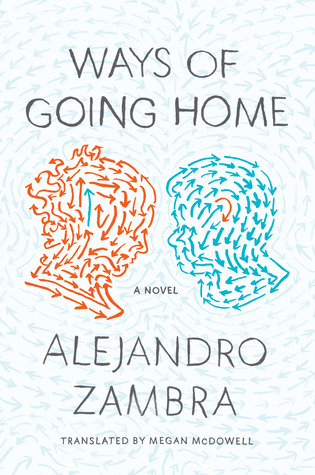 Ways of Going Home by Alejandro Zambra was short. That was the first thing I noticed – it was a small book. Apparently, Zambra’s previous two books were also super-short. There are three or four stories contained in the book, all connected but all distinct. This is interesting because – did I mention? – the book is short. As a result, the book ends up reading like poetry. Good poetry. Given the amount of poetry peppered throughout the book, I imagine this is what Zambra was going for. The book is split into four parts, each circling around a particular period of childhood and how that’s echoed into the narrator’s adulthood. One part is a child narrating his life, one clouded in secrets and unknowing. The next two parts are the narrator, grown up and writing about that child, and then the child grown up, meeting a childhood friend. The final part returns to the narrator. It’s a particular childhood, rooted in specific time and place in history – a post-Pinochet Chile. The child in the book is stumbling around the fallout of a deeply divided violent past. The adults, later, are dealing with learning the secrets they spent so much of their childhood bumping into unknowingly. This is a strange book. There are women, but it’s not a love story. There are spies and the ghost of a war, but it’s not a war story. There are parents, but it’s not a story about accepting or rejecting them. More than anything, it’s like a piece of poetry that tries to get at a very specific feeling. While the book isn’t poetry, it’s doing a similar job. At the close of the narration, there’s an emotion, more than anything else. I’ve been trying to be more accurate, to really evaluate the story. However, I’ve decided there really isn’t a story; or if there is, it’s not really about the story. Poetry is not my thing (Story is my thing.) so this book doesn’t go in the permanent collection. It was a good book, though, and gave me some insight into a world and a history and a heritage I don’t know much about. Ways of Going Home made me want to read more about Chile’s history. For that, and for evoking a feeling without being trite, this book gets four stars.